After watching the MK Awards from my not-so-comfy couch at home last year, I was mighty chuffed to get the chance to go this year's event which took place last night at the State Theatre in Pretoria. In case you missed it: the list of winners (and my two cents worth). Bittereinder's Jaco van der Merwe and Straatligkinders frontman Bouwer Bosch hosted the awards, and their witty repartee was quite amusing to watch. Other presenters included last year's host, Jack Parow as well as Toya Delazey and Shane Durrant. I find the last one quite ironic, considering Desmond & The Tutus have been snubbed since their inception, but the audience burst out laughing each time Shane dryly read off the teleprompter, insuring that he quickly became not only a crowd favourite, but a Twitter favourite too. Bittereinder kicked things off with their performance of “Die Woud”, which featured Magdalene Minnaar’s chillingly ethereal vocals. Iso emerged from beneath the stage to perform a medley of sorts. It would simply be a crime not to mention the band’s meticulously styled hair in this here blog post, so there it is. Living up to the hype that has surrounded them, Afrikaans folk rock band, Spoegwolf, delivered a solid show. 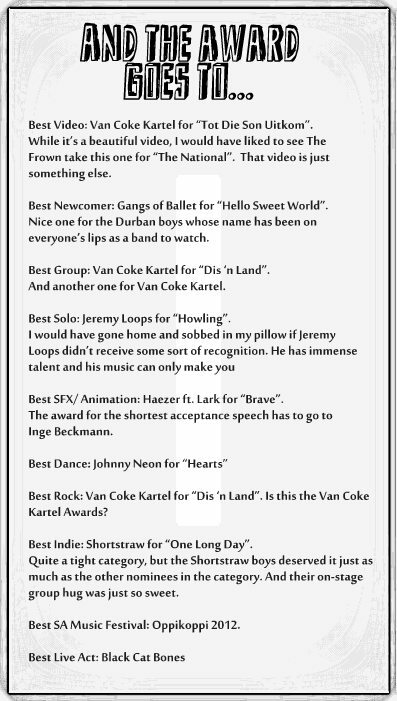 Tailor wowed everyone with another one of her intense performances while Van Coke Kartel once again proved why they are awards favourites. Jaco van der Merwe and Bouwer Bosch performed “Kanker”, a tribute to a friend who has just passed away from cancer. As winners of the Best Live Act category, Black Cat Bones ended things off, confirming that they are a live act to beat. Man, I’m so glad that these chaps have finally gotten the credit they deserve. Although I'm not entirely convinced of the merits of a viewer-voting system for an awards show, this year's MK Awards was well put together and heaps of fun. The Tomato watches we got as gifts were pretty rad too.